Back in the days of killer newts the size of cars, swimming for fun wouldn’t have been a priority. But Metoposaurus algarvensis, the fearsomely toothy and giant ancestor of newts, rampaged in the Triassic period long before humans or anything resembling our ancestors existed. When you see tiny-toothed smooth newts (Lissotriton vulgaris) small enough to sit in the palm of your hand you are looking at a creature with ancient lineage, older than dinosaurs. Stunt swimming, ice swimming, urban swimming, swimming after bears, Channel swimming, lake swimming, river dipping – from the Lake District to Dubai, via London, Montana, Geneva and Tooting. 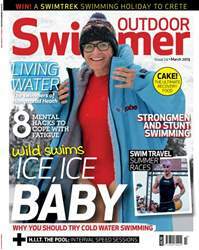 It's all in the March issue of Outdoor Swimmer. Plus, training, technique, stunning photographs, inspiring stories. And cake!